The MEMORI reading group meets on Wednesday the 5th of August, from 3:10 to 5 pm, in Rm 2.04a/b to discuss a selection of readings on the themes of death and exile in Troy. While the great epic romance of Troy provides much material for discussion, we will be focussing specifically on the themes of exile and death, events which bring the love affair of Troilus and Criseyde to an end. The affair between these two characters is a significant medieval addition to the ancient tale of the Trojan war, taking place between Troilus, son of Priam, and Criseyde, a character evolved from a conflation of Briseis and Cryseis, Trojan captives of Achilles. 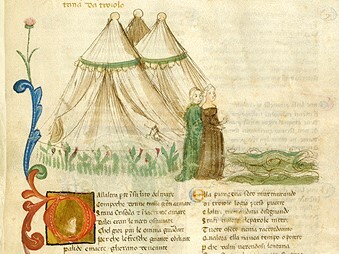 In placing the love affair at the heart of Il Filostrato, Giovanni Boccaccio greatly amplifies the romance between the two characters from its source in Benoît de Sainte-Maure’s Le Roman de Troie. 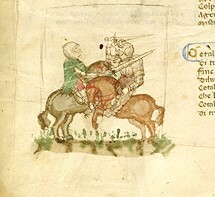 Chaucer’s Troilus and Criseyde follows the plot of Il Filostrato, although the influence of Boethius’s De consolatione philosophaie redirects the focus of the text to an exploration of fate, fortune, predestination and human agency. Troilus, prince of Troy, has been engaged in a long, clandestine affair with Criseyde (Briseida/Creseida), the daughter of Calchas, seer and servant of Apollo, whose knowledge of Troy’s impending destruction led him to flee the city for the Greek encampment. Wishing to save his daughter from the fate of the other Trojans, Calchas persuades the Greeks to demand Criseyde in return for their prisonor, Antenor (who will later betray the city). The secret nature of the love affair prevents Troilus from being able to halt the exchange. Our readings begin from the point of this exchange being agreed and include the seduction of Criseyde by the Greek Diomede, an exchange of letters between the lovers, Criseyde’s failure to fulfil her promise to return to Troy and Troilus’s eventual death. These texts devote much attention to a love affair taking place in the midst of a lengthy siege. While the narrator and audience are, of course, fully aware of the city’s fate, the war and its violence appear to be subordinate to the appropriate conduct of lovers. How do the contradictions inherent in this elevation of romantic/sexual love over the business of war affect the texts’ treatment of a) Diomede’s seduction of Criseyde and b) narratorial condemnation of Criseyde’s betrayal? In Il Filostrato and Troilus and Criseyde, Criseyde’s gaze upon the walls of the city from the Greek encampment mirrors Troilus’s longing watch from upon the walls. To what extent is Criseyde portrayed as an exile? How should we understand her assertion to Diomede in Il Filostrato that she wishes to partake of the city’s fate alongside its inhabitants? What is the meaning of her shifting allegiances? The texts are inconsistent on whether Criseyde is the only woman among the Greeks or whether she is amongst others. What might be the reason for the inconsistency? In contrast to the lengthy prelude to the love affair in Boccaccio and Chaucer, and the lengthy speeches in all three versions, the death of Troilus is an abrupt occurrence. Can this be seen as a reassertion of the brutality of war, an interruption of an escapist dream of love? If not, why not?